Nearly 30 firms and 20,000 farmers will take part in producing 25,000 tonnes of tea of international standards in a project to promote the private-public partnership (PPP) model in tea production. The information was released at a conference to launch the second phase of the project “promoting tea farmers to join the sustainable and quality tea supply chain” in Hanoi on February 28. 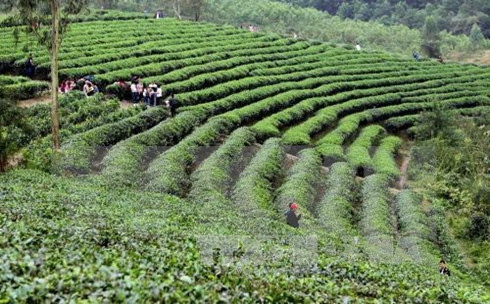 The project, jointly implemented by the sustainable trade initiative (IDH) organisation of the Netherlands, the Unilever group and the Ministry of Agriculture and Rural Development (MARD), aims to train and provide technical assistance for farmers to produce tea certified by the Rainforest Alliance (RA). Le Quang Chuyen, Deputy Director General of the My Lam Tea JSC in northern Tuyen Quang province said the PPP model has helped improve tea quality and productivity while saving production costs and labour. Their tea products meet food safety requirements of the EU and Japan. Tran Vu Hoai, Vice President of Unilever Vietnam, underlined tea quality improvements after three years of implementing the PPP model, saying that the group raised its import volume of Vietnam’s tea from 5,000 tonnes to 11,000 tonnes. He expressed his hope that with the model will continue improving Vietnam’s tea quality and the group can import up to 20,000 tonnes of tea from Vietnam. Under the second phase of the project, 15 factories and 6,500 households are expected to work together and produce 25,000 tonnes of tea, including 15,000 tonnes of RA certified tea, which are shipped overseas and supply for Unilever. So far, only eight firms have registered to join the project. Besides, the Vietnam Tea Association is implementing an IDH-funded project on the quality and sustainability of the tea industry. The project aims to enhance Vietnam’s tea quality to meet international standards.